An ornament representing a young maiden bearing a basket of ceremonial offerings on her head, used either as a column support or as a freestanding garden ornament. 1.Ornament representing a maiden (youth) bearing a basket of ceremonial offerings on the head. 2. 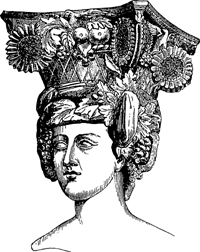 A caryatid with basket on her head; used either as a support or as a freestanding garden ornament. La cafeina es un alcaloide producido por plantas, entre las que se destacan principalmente la Coffea arabica y la Coffea canephora, guarana, yerba mate, cacao y te como la Camellia sinensis. Respecto a nematodos los productores mencionan dos formas: implementacion de injertos con patron de Coffea canephora P.
Isotermas de sorcao de agua de frutos de Coffea canephora. The local coffee of the province is made mostly of robusta from the coffea canephora plant, with low acidity and high bitterness. Isotermas de sorcao de agua de frutos de Coffea canephora [Sorption isotherms of fruits of Coffea canephora]. Potencial de formigas (Hymenoptera: Formicidae) como agentes anti-herbivoros em cultivo de cafe (Coffea canephora Pierre) e Feijao Guandu [Cajanus cajans (L.
The coffee plant shares a botanical family with the gardenia flower, and while there are thousands of different species of coffee, only two are commercially significant: arabica and canephora. 2004 Drought tolerance in relation to protection against oxidative stress in clones of Coffea canephora subjected to long-term drought. These native vegetation fragments are inserted in a matrix, which was anthropized by agricultural activities, primarily extensive beef cattle livestock and small coffee plantations (Coffea canephora Pierre ex A. The two main grown species, Coffea arabica and Coffea canephora, represent 70. 1) The liquor prepared out of Arabica beans possesses all the characteristics of a high quality coffee that is globally acceptable, while the other species like canephora, congensis, liberica and the species of low importance could not overtake Arabica in its quality performance. Nonlinear relationships between SPAD values and Chlorophyll content were reported for Betula papyrifera , Carica papaya , Coffea canephora , Eucalyptus nitens and E.